I was a little more than halfway to work when I realized I had forgotten my bicycle helmet. I was already running late, because I am supposed to be in early on Mondays and I never remember that when I'm getting up on Monday morning. And there's not a lot of point in turning back for a helmet when you're past the halfway point anyway. On the last turn before the driveway for the bank, from one little side street to another, I took the turn a little too tight. 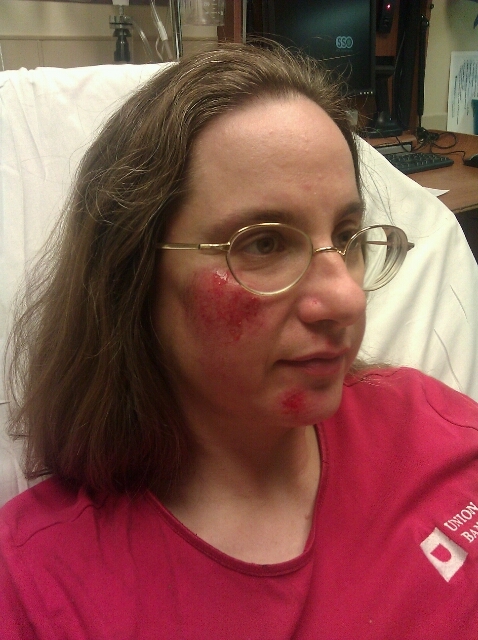 My bike dipped into the turn, then dipped too far, overbalanced, and I skidded sideways against the road, my hand sliding to brake my fall but not enough, the side of my face hitting pavement. I picked myself up. My palm was skinned and bleeding from three places. My face hurt. I seemed largely intact. My bike was fine. I got back on, rode the remaining hundred yards to the bank, and went inside. From across the lobby, two of my coworkers said "Good morning!" I thought, Oh good. I must not look too bad. I felt a little unsteady on my feet as I lurched to the bathroom to wash off my hand. I looked at my face in the mirror. It was instantly clear to me that my coworkers had not been able to see me in any detail. "All right" did not cover it. I looked awful. Worse, I felt dizzy and my vision was narrowing in that "maybe you should think about passing out" way. I cleaned the scrapes as best I could and went to my co-workers. "Do you think you could give me a ride to the ER? I'm afraid I might have a concussion." Kristina stared at me. "... Yes. Yes, I can certainly do that. Just a moment." Kristina was incredibly nice and stayed at the ER with me through the whole visit. To their credit, the ER was reasonably efficient about each step of the process, which involved about five nurses, one doctor, and two people to take my personal information. I got a CAT scan, which involved fewer flashy lights than it does on TV. My head was fine. A nurse bandaged up various scrapes -- on palm, knee, and face, leaving the contusions on my shoulder and arm that weren't bleeding unbandaged. After around 2 hours, they released me. Kristina was kind enough to let me stop by my house to pick up a cold pack. Which I wore on the ride after work. Because of course I still went for a ride after work. By then I was no longer dizzy, and no more tired than I usually am after work. It's not like the scrapes were going to hurt more or less depending on whether I biked or not, and I do need the exercise. If I'd been thinking, I would have stopped at Wal-Mart during the bike ride to get my glasses fixed -- one of the arms bent during the fall -- and the prescription filled. The doctor was very confident that the contusions would hurt more later, although they still have not been bothering me much. Instead, I forgot the prescription at work, and drove back to the bank after exercise to pick it up. And, naturally, locked my keys in the car because I had not messed up enough things yet today. A different co-worker kindly gave me a ride home to get the spare, and a ride back. I seem to be at my quota of disasters for the day, because the rest of the evening went fine. In a way, this was probably a good thing. I am pretty much okay, and after all that I will never forget my helmet again.